The Rockville RPG8BT powered PA speaker is simply amazing in terms of sound quality, raw power, and features! This model offers the same great sound as our original RPG8 but this new version also offers bluetooth integration, USB input, SD card input, graphic EQ, and a wireless remote control. This speaker has an incredible 400 watts of peak power and will deliver a massive amount of bass, mids, and highs. The ultra-efficient design is amazing! State-of-the-art 1.35'' Japanese made pure titanium-diaphragm compression driver for crystal clear high-frequency reproduction. Ultra-wide dispersion, 40° large-format horizontal wave guide horn molded directly into cabinet. Ultra-low noise Mic / Line input via combo XLR & 1/4-inch TRS stereo jacks with volume control. Additional balanced RCA line output for linking of additional speaker systems.. Stand mounting with 35-mm pole socket. Ergonomically shaped side and top mount handle for easy carrying and setup. 115 Volt power supply with external user serviceable fusing. 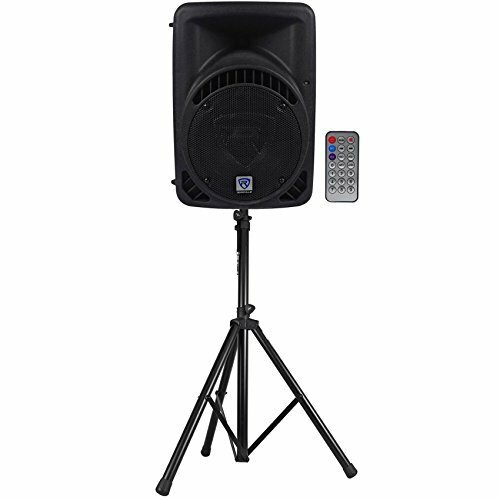 Dimensions : 11.54" X 8.98" X 16.23"
8" 400 Watt Active DJ/PA Speaker With Built In Bluetooth and Bluetooth signal input. Now you can input any audio signal from your Bluetooth enabled music player or phone. No cables necessary! USB/SD digital MP3 music player. Input audio signals, special effects, any preprogrammed audio file and amplify it through your system with Wireless remote control. Enjoy the added convenience of being able to adjust any of the MP3 player functions, including volume, from the included wireless remote. High-power 2-way pro sound reinforcement speaker system for live sound and playback applications and Compact and light weight system delivers distortion free sound even at extreme SPL with Linear Class AB amplifier technology: high power, transparent sonic performance. Internal switch-mode power supply for low distortion audio with superior transient response and Built-in bass and treble equalization processor for ultimate system control and speaker protection.